by Richard Fiore, Director, RF Applications Engineering – American Technical Ceramics Corp. It is generally assumed that the capacitance value selected from a vendor’s catalog is constant over frequency. This is essentially true for applications with applied frequencies that are well below the capacitor’0s self-resonant frequency. However, as the operating frequency approaches the capacitor’s self-resonant frequency, the capacitance value will appear to increase, resulting in an effective capacitance (CE) that is larger than the nominal capacitance. 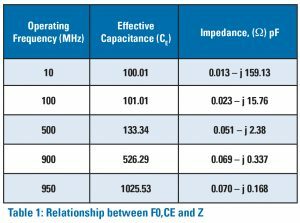 This article will address the details of effective capacitance as a function of the application operating frequency. In order to illustrate this phenomenon, a simplified lumped element model of a capacitor connected to a frequency source operating in a network will be considered, as depicted in Figure 1. This model has been selected because the effective capacitance is largely a function of the net reactance developed between the capacitor and its parasitic series inductance (LS). The equivalent series resistance “ESR”shown in this illustration does not have a significant effect on the effective capacitance. The nominal capacitance value (CO) is established by a measurement performed at 1 MHz. 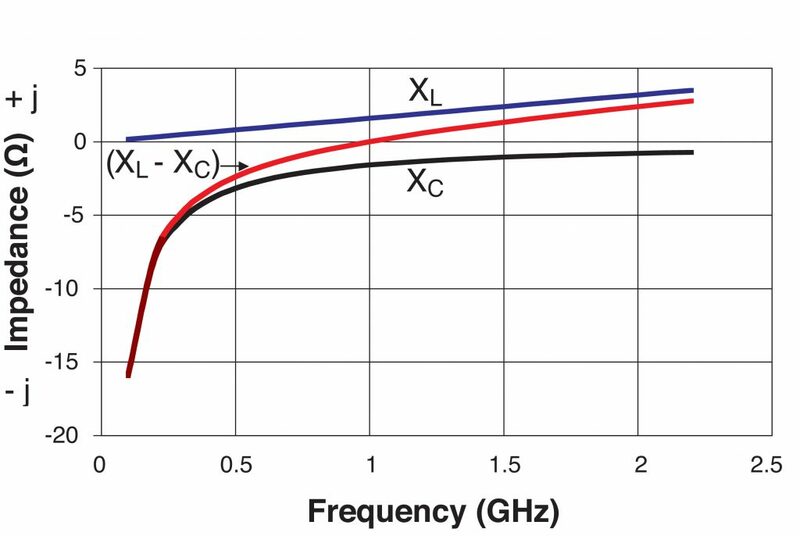 In typical RF applications, the applied frequency is generally much higher than the 1 MHz measurement frequency, hence at these frequencies, the inductive reactance (XL) associated with the parasitic series inductance (LS) becomes significantly large as compared to the capacitive reactance (XC). Figure 2 illustrates that there is a disproportionate increase in XL as compared to XC with increasing frequencies. This results in an effective capacitance that is greater than the nominal capacitance. Finally, at the capacitor’s series resonant frequency, the two reactances are equal and opposite, yielding a net reactance of zero. The expression for CE becomes undefined at this frequency. From this relationship, it can be seen that as the applied frequency increases, the denominator becomes smaller, thereby yielding a larger effective capacitance. At the capacitor’s series resonant frequency, the denominator goes to zero and the expression becomes undefined. The relationship of CE vs frequency is a hyperbolic function as illustrated in Figure 3. 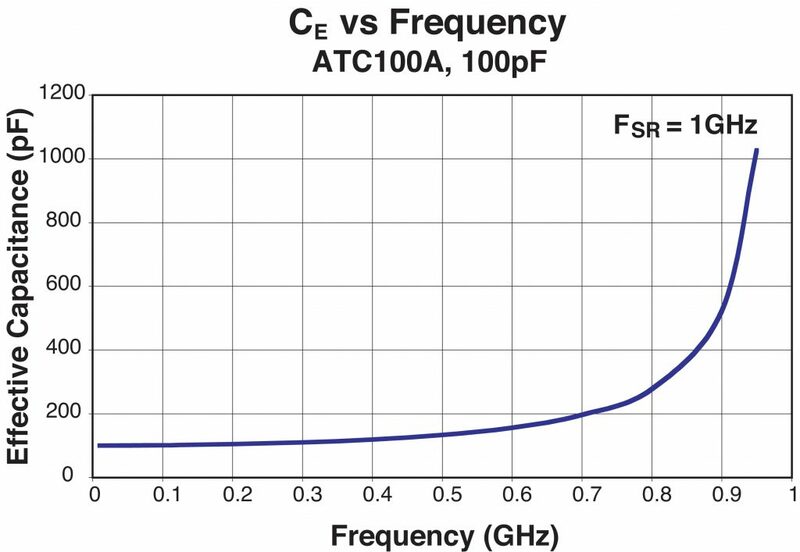 Consider an ATC 100A series 100pF capacitor. Calculate the effective capacitance (CE) at 10MHz, 100MHz, 500MHz, 900MHz, 950MHz. CE = C0/[1– (2π F0) 2 LS C0]. Refer to Table 1. Impedance matching and minimum drift applications such as filters and oscillators require special attention regarding CE. For applications below the capacitor’s self-resonant frequency, the net impedance will be capacitive (-j), whereas for applied frequencies above resonance, the net impedance will be inductive (+j). Operating above series resonance will correspondingly place the impedance of the capacitor on the inductive side of the Smith chart (+j). When designing for these applications, both CE and the sign of the net impedance at the operating frequency must be carefully considered. In contrast, the majority of coupling, bypass and DC blocking applications are usually not sensitive to the sign of the impedance and can be capacitive or inductive, as long as the magnitude of the impedance is low at the applied frequency. The effective capacitance will be very large and the net impedance will be very low when operating close to resonance. At resonance, the net impedance will be equal the magnitude of ESR and the capacitance will be undefined.